Her ex-partner's actions have put her in path of a killer. Can she survive? 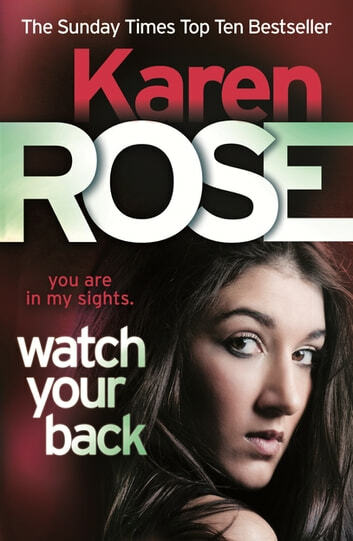 WATCH YOUR BACK is a pulse-pounding thriller, part of the Baltimore series, from bestselling author Karen Rose. 'Intense, complex and unforgettable' James Patterson. Stevie Mazzetti knew she would never get over the murder of her husband and son. But with their killer behind bars, she was able to move on with her life, if only for her daughter's sake. Now, eight years later, the Baltimore detective always fights for the victims she meets and when she learns that her ex-partner may have miscarried justice, Stevie's determined to right the wrong, even if it means she is in danger. Clay Maynard has always wanted Stevie and when she is targeted by a vicious psychopath, he believes that protecting her may give him the chance to have her in his life forever. Clay will do anything to keep Stevie safe but with a killer on her tail who has everything to lose and a secret to hide, will they stay alive long enough to find happiness? Positively brilliant, an absolute page turner, one of those rare things, a book you hate to finish, because you know you won't find another as good for a long time, waiting now for the next Karen Rose. A great read as usual Can't wait for the next.